Bali is tropical paradise so my trip was initially family oriented. A wedding in which I spent a little time with the family and then I went of to explore the island. Initially a place called wanigiri a small community in the mountains of central Bali. Where myself and my mom stayed for a night explored a local waterfall for a day. It stated it was 3km away which wasn’t to bad. But on the way down it was sheer hills and descents on slippery wet surface I struggled let alone my mother who enjoyed it non the less. But it was an experience, so we spent a few hours doing that and then retired to our airbnb host. So the following day we headed back towards the coast as I had an appointment to meet a snake hunter not in the sense hunt a local wildlife expert where he would catch, photograph, educate people and then release the snakes. I arranged a meeting time for 2000 that evening it gets dark quickly in the tropics so ideal for finding snakes as diurnal (day) snakes would go to edges of trees to sleep and keep of the ground and nocturnal (night) active species would be on the hunt for a meal. Snake species in Bali upwards of 35 I could attempt to name them all but I won’t. But in comparison to the UKs three species smooth snake, grass snake and the adder our only venomous species. It was my ideal activity and most excited for throughout my balinese trip. As we met I was prepped with my head torch which didn’t work sadly but a bonus is my guide had a spare. I hopped on the back of his rickety moped main mode of transport and much more efficient than a car especially on leaving or entering the cities. He knew the area like his own backyard he worked at a local bird sanctuary and he would get calls sometimes daily to remove a snake from a built up area. To educate people and then release it. 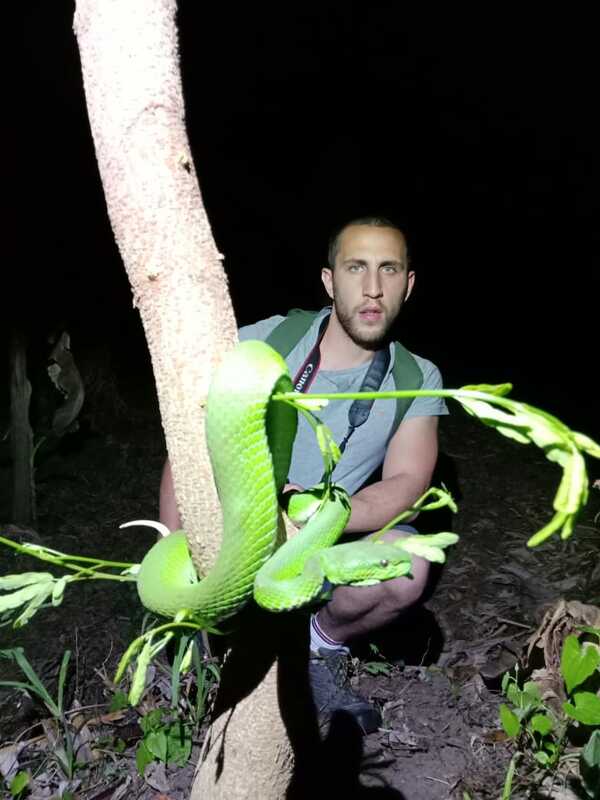 So we were all ready to go to our first area which was a freshwater habitat which led out to the ocean prime location for a number of snakes in Bali but we found only one the dog faced water snake Cerberus rynchops. It was a peculiar looking snake and when looking it was all over the place in the space of an hour we had gotten hands on with about 8. Which didn’t add to the ones we couldn’t reach in the mangroves of the area. So having been to focussed on the search I fell waist deep into stagnant water an early night I thought but with the expectation of seeing reticulated pythons and sea kraits I continued through the night. Our 2nd location was the beach it was a small rocky dirty road after 20 minutes from location 1 I could hear the hammering of the waves and again he mention as we got of the moto for a snack and water break. Yellow lipped sea krait was our next hopeful find as they come up to land in order to lay eggs as do sea turtles. The beach was braced by huge boulders flood defence I presumed but it was a strange sight to see boulders as big as cars and 100s of them lined the waterfront no houses as far as I could see prime spot I thought. A few elderly blokes coming out to pray and pay respects to the chosen deity, for good luck mainly as my guide also did it at this location. Without any luck an hour up and down the beach it was pitch black and only stars was our light. We headed back to the bike and then the main road. And people and the excitement and recklessness of the moto drivers on the road. It was now an hours drive into, heading to our 3rd location of the evening. We spoke about what we do or have done my reason for being in Bali I would ask the odds in finding a reticulated python he replied possibly. I then laughed and asked of a king cobra he point blank said no chance 3 days maybe in west Bali and only if we pray a lot. Me included the least religious person I know I laughed it and we pulled into a small side road and the small village way of life rice paddy fields and tea fields. It looked surreal and even in the night like this the stars began shining it was 80% humidity and about 25ºc I wished for rain but non came at all. So the 3rd location a rice paddy field with all the rodents any snake could wish for. We would climb 2 fences initially and then continue on the narrow footpath with caution, I remembered my first time in Sumatra I asked about leeches. He stated Bali does not have them we are ok, I laughed and replied good they got everywhere. So the first snakes would be high in the trees I seen sleeping birds sleeping geckos and non other than the tokay gecko, a species I had only ever seen on tv shows where presenters where getting nipped by them. There was some eyeshine in every direction. I wondered the reasoning behind this growing up it is known as the (tapetum lucidum). In lehmans terms it is a second helping to the available light so light get In reflects and comes back out receiving the light twice. From spiders to cows have this. Exception to a few primates for example and ourselves. So the first snake encounter was with the ever aggressive green vine snake Ahaetulla prasina. At first I couldn’t see what he was pointing out the camouflage of this snake is the best I have seen having seen them in captivity it does not do this snake justice. So fIrst the viper. The white lipped pitviper this snake is so pretty I see them in a lot of private collection and zoological parks. I wasnt expecting to see this snake on night excursion to a rice field. This snake to me epitomises jungles of southeast asia and I would only hope to see them on excursion deep into the forests throughout Indonesia. But we came across it in somebodies rice paddy I couldnt of hoped to see this if I was on my own it takes a well trained eye to decipher animal camouflage in the day at the best of times let alone at night, This snake is highly venemous and is a significant threat to human life if bitten by one. The snake is widely distributed from mainland asia to the many islands of the indonesian archiplago. The snakes venom affects the blood primarily with pro-coagulant properties which does as it says and clots the blood which effects the bloods function to deliver oxygen to vital parts of the body, there are some reports of this snake appearing bright blue on other islands such as Komodo which wasnt to far from where I was maybe next time I will hunt for the blue variety. being sure it was not a king cobra as they look so much a like at night I missed my attemot and my guide attempted then and he was succesfull it was huge. Very hard to keep a hold of the size was 2 metres plus longer than I am tall this snake was irratic and slightly angry there are very few animals in its region which would be considered a natural predator of this formiddable species, with the exception of the King cobra. As juveniles it would be birds of prey and small mammals but this secies had nothing to worry about apart from me and my guide. We held it for some time admireing it at no chance it attempted to bite although very irratic there was no threat posturing no open mouth striking just frustration and the want to go back to his nightly activity which this species is sleeping we must of interrupted her nap. At the time of holding it and taking records and pictures, to bare in mind this snake is not venemous at all. This next snake the malayan krait, also known as the blue krait Bungarus candidus for anyone with any form of snake knowledge, the word krait instills fear and respect rarely seen of snakes. Although it is a huge oppurtunity to get hands on with this extremely potent but placid snake. People who work in the reptile research or herpetology as its known. Spend years in the feld and weekly stints at a time rarely get to see a snake like this I saw this on my first trip to Bali and my first reptile hunt in-country. The sheer luck or the sheer knowledge of both parties involved... Played a huge role in the success of the night. So this species may get to in length a little over a metre, a snake this small and this venemous is a huge risk to handle but to document the finding in a place where we had found him/her had to be done. The snakes level of toxicity can be judge on the bite to death ratio 80% of people who are bitten by this snake are unaware of it, it is said to be painless and feel as if you are sleepy but then the person actually dies known as a neurotxic venom affecting the nervous system. From the young as soon as they hatch they are as venemous as there parents. We took some information and some photographs and we happily left him or her alone. So after these encounters are reted and ate the rest of my cakes biscuits and rank the remaining water. Spoke in length about the snake we had come across I was so pleased i was unhappy it was finishing soon but I knew it had to. I bagged up my rubbish and we set of back acros the huge rice fields navigating the narrow walkways criss crossing the man made irrigation system. On our way back it was topped of by a snake only seen 10 metres up the tree the cute and sleepy stuffed painted bronzeback Dendrelaphis pictus. This snake is primarily diurnal active in the day so we had came across this one half asleep about head height up a tree. He had his back to us we didnt get hands on with this snake as we could see evidently he had ate something earlier on in the day before going to sleep. As we though if handled he will have rgurgitated his hard earned meal in a bid to escape as most snakes do with the aim to lesson the weight to move quicker. This snakes has a pretty threat posture I learned from my guide that night, with him impersonateing the snake blowing himself up with his cheeks. He said they do this and they show blue scales under the duller brown ones. The photographer n me said would of been a nice shot but lets not attempt it. Also this snakes is widely ditributed all over Southeast asia.